Most people don’t think about whether there will be dial tone before they pick up their phone. Many years of effort have gone into stabilizing telephone services since the days of Alexander Graham Bell, yet many IT organizations don’t put the same level of effort into their own services. As a result, their businesses have lost confidence in their IT organizations and respond by cutting budgets, outsourcing and by purchasing new services from third parties. Incident and Problem Management processes can help stabilize your systems, reduce calls to your service desk and assist the organization to run more powerfully. 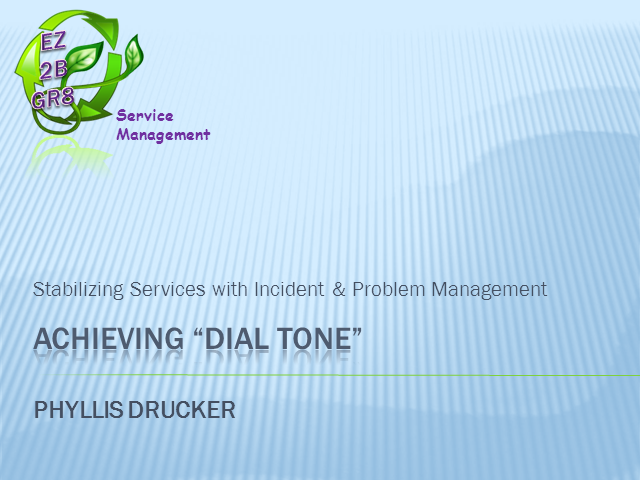 In this webinar Phyllis Drucker, President of EZ2BGR8 Service Management will provide a blueprint for implementing simple incident and problem management processes that will help your organization become more proactive and stabilize your services.